Opened on December 31st 1934, the Glasgow Paramount was one of the later cinemas built for the chain in Britain (which also included Manchester and Newcastle, amongst several others). The architects were Frank T. Verity and Samuel Beverley, who designed many of the British Paramounts - this was their only cinema north of the border. Glasgow's Paramount was freestanding, and occupied half a city block. The facade was built in white granite, with five two-storey finned windows curving around and above the corner entrance. At night, the entire building was outlined in neon. The main foyer had an open staircase to the upper foyer, which looked down onto the ground floor, and was home to a tea room and restaurant, situated under the tall corner windows. A further cafe was situated upstairs from the main restaurant (behind the windows to the right of the corner in the main photo above). The auditorium sat nearly 2,800 in the circle and stalls, and was originally decorated in green, copper and silver. The stage area was spacious, with a tall full-height fly-tower, and around fifteen dressing rooms at the rear of the side elevation, as well as under the stage. A Compton organ rose from this understage area (remarkably, the organ console survives, and is currently being housed in Summerlee Heritage Park in nearby Coatbridge, whilst it is restored by the Scottish Cinema Organ Trust). 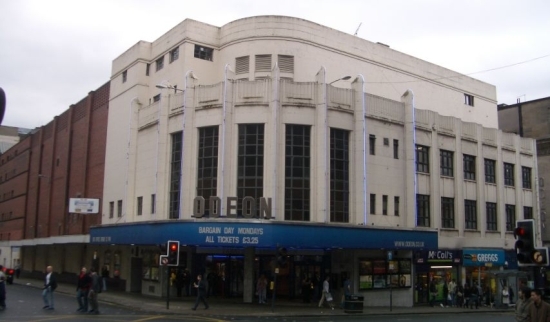 In 1939, the cinema, along with all other UK Paramounts, was sold to the Odeon circuit. Under this name, it continued successfully until 1970, with live shows augmenting the film presentations. Most famously, both the Rolling Stones and the Beatles played at the Glasgow Odeon. In 1970, the cinema was closed for a year and comprehensively remodelled. This involved stripping almost all of the Italianate interior out and creating 3 screens - one in the former balcony extended fully forward, one in the former stalls (both seating around 1100), plus a smaller screen in the former stage area. This latter screen, seating 555, was formed over two levels, with a small balcony, and had a seperate entrance to the side of the building. The foyers were remodelled too, with the double height sections being floored over, and the main staircase realigned. The cafes were walled off to become offices and staff areas, and a bar was placed in the top foyer, although the view from the corner windows was now sadly blocked. The exterior did not escape drastic modernisation either: the corner windows and fins were hidden behind a giant, full height readograph, lit from behind, and with corrugated metal sheeting covering much of the granite around it. In 1988, the screen in the original stalls area was further subdivided into three screens, of around 220 seats each, and the balcony and stalls of the smaller Screen 3 were split into two, giving a total of six screens. Access to all screens was now from the main corner entrance. A further subdivision in 1999 saw the 1100 seat Screen 1, in roughly the former circle, divided into four screens, bringing the total to nine. The current Screen 1, at 555 seats, is now the largest in the complex. This refurbishment also saw the bar being removed and, happily, the exterior was restored to something like its former glory, with the removal of the readograph and corrugated sheeting, and the re-instatement of a simplified version of the original neon lighting scheme. Sadly, only a few years later, Odeon sold the building (along with the Odeon Edinburgh) in March 2003 to property developers. Two months later, Historic Scotland afforded the building some degree of protection with B-listed status. Planning permission [PDF of planning report] was granted in 2004 for demolition behind a retained facade, and the construction of a new interior for leisure and retail use. The plans involve reinstatement of something akin to the original external neon lighting scheme, and there is also a requirement to strip out all non-original features to search for any plasterwork or other original decoration prior to demolition starting. It is now on the Buildings at Risk list. Despite the comprehensive nature of the interior alterations over the years, several small pockets of original decoration and plasterwork did remain intact. 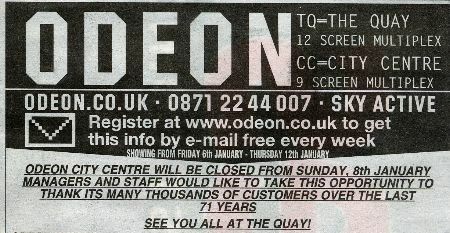 It was leased back to Odeon on a short-term basis whilst the developers completed their plans - closure finally happened 7th January 2006, and the building was stripped of seats, projection equipment and anything else useful. 9 - 222 (31.5 ft) - Chronicles of Narnia. 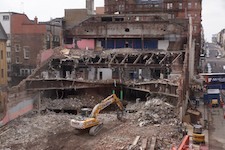 In March 2013, after a number of different schemes had been mooted by the owners, the demolition teams finally moved in, and work started to demolish the auditorium block to allow a large office block to be built on its site. The entrance foyer block is to be retained as a separate unit, with permission to use it as a boutique hotel. Click here for a large gallery of demolition images. Click here for more exterior pictures of the Odeon prior to demolition. 2, 3,4: Paramount 4c/10 Compton Organ, with Lyndon Laird (3) and Frank Olsen (4).